CDex comes with a few formats which you might like. This is based on the bundle of software and the formats for the software is WAV, MP3, OGG, FAAC and APE. The software can also do CDDB query (Compact Disc Database is a database such as FreeDB for software applications to look up audio CD information so it will keeps the songs details), ID3, ID3V2 field completion as well as the use of automatic file naming. These are all very helpful as it keeps the information about the audio on the converted files as well. The CDex also comes with PLS and M3U playlist files options as well as support for ID3 V1 and V2 tags. Unlike other GUI interfaces the software does come with advanced jitter correction as well as its own media player such you dont need any additional player with this software. There is also native support for supporting CD-Text as well as like some others it comes with support for normalization of audio files which is becoming a standard addition. There is also recording from an analog input line which is new however it is very good as it allows you to normalise audio from other external sources such as a microphone. 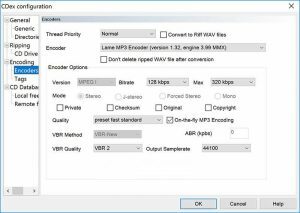 The trans-coding of compressed audio files as well as supporting different CD drive types simply adds to an already great package for ripping CD files. The software does get updated from time to time but that is mainly small bug fixes as well as changes to Lame. Note that this is a portable version so you dont need to install it as it will run from a USB driver if it has too. You can find a USB driver here if you nee one. This is version 1.83.